Baby door bouncers, or jumpers, consist of a seat attached to stretchy, bungee-like cords that clamp to the top of a doorway. They allow pre-walking babies to burn off extra energy and enjoy some freedom of movement. Although many babies enjoy these devices, the potential safety risks associated with doorway jumpers might make many parents think twice before using them with their children. Numerous safety issues, including a U.S. Consumer Products Safety Commission recall of more than14,000 doorway jumpers in 2005, make these jumpers a less-than-safe option for your child. 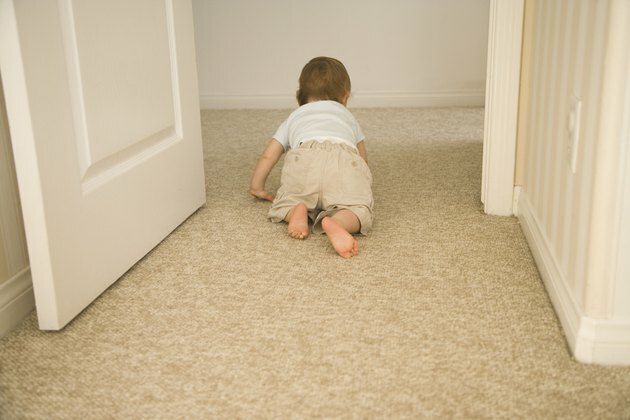 The ConsumerReports.org Babies and Kids blog suggests that parents consider doorway jumping an “extreme sport” for babies. They advise choosing a stationary activity center or stationary jumper in lieu of a doorway one to avoid many of the potential safety hazards associated with their use. Most of the baby jumper recalls involve breakage of the clamp holding the doorway jumpers up or the straps attaching the clamp to the seat. If these parts break, children can potentially fall onto the floor and sustain injuries. Your child’s vigorous jumping movements — or the push of a “helpful” sibling or older child — can also cause him to collide with the doorway. If you elect to use a doorway jumper with your child, buy a new one to ensure the straps and clamps are in good condition. Safe Kids Canada, the national injury prevention program of The Hospital for Sick Children, urges you to select a model appropriate for your child’s weight, height and age. Follow the manufacturer’s directions carefully when setting it up. Check the instruction manual for information on doorways that work with these types of jumpers. In addition to safety concerns, Dr. William Sears, a pediatrician and author of “The Baby Book: Everything You Need to Know About Your Baby From Birth to Age 2,” expresses concerns about baby jumper’s effects on your baby’s physical development. According to Sears, these types of devices can reverse the normal pattern of development and give your baby’s bottom half abilities that his upper half cannot handle. Excessive use of these types of devices, including jumpers, activity centers and walkers, can potentially lead to delayed motor skills. Whether you choose a stationary activity jumper or a doorway model, limit your child’s time in the device. Do not use the device as a babysitter and stay near her while she jumps. Sears suggests using the device for a few minute each day to allow your baby to burn off some energy or enjoy a change of scenery. Encourage your baby to spend most of her “play” time on the floor sitting, crawling, cruising and perfecting other motor skill milestones. How Long Can a Baby Sleep in a Cradle? Is a Bouncer Harmful to a Baby's Development?